At Liaison Linguistics, our policy is to provide our clients with the best possible services to promote effective communication and to ease the pain of the language barrier. We cater to our clients' needs in different situations with exemplary professionalism. We promise to deliver top quality service with a personable attitude to create a comfortable and pleasant working relationship between our team members and our clients. Most importantly, we understand and honor our clients' privacy and confidentiality. You can entrust your language-related needs to Liaison Linguistics. Our Promise - To provide the best service possible to ensure the highest customer and client satisfaction. We pledge to help connect the community while maintaining the strictest level of confidentiality. We undergo continuous training for professional development. Our team consists of some of the best professionals in the metro Grand Rapids area. Our team leader has extensive experience in working as an interpreter/translator for the United Nations and international organizations. Majority of our interpreter/translators are well trained and certified in the medical and legal field. Liaison interpreters also has extensive experience woking in educational and manufacturing settings. Their diversified backgrounds truly prove to be a valuable tool while working with our clients on different cases. In addition, Liaison Linguistics is one of the CCHI testing sites for oral test. Anh ​Nguyet ​Tran is a former translator and interpreter for the United Nations High Commissioner for Refugees (UNHCR) in Japan and Korea. She worked in Japan for over seven years and was responsible for being a liaison between the UNHCR and the Japanese government, the Korean government and Indochinese refugees. Her duties include coordinating refugee movements, resetting refugees from Japan and Korean to all over the world. Anh returned to Grand Rapids, Michigan in 1996 and worked as a free-lance interpreter and translator. Upon seeing that there was a need for well-qualified and trained interpreters in many different languages, Anh founded Anh Okada's Interpretation and Translation Services to build upon and share her passion and experience to others in the field. As the result of the high standard and the number of professional interpreters employed, Anh set out to expand the agency and created Liaison Linguistics in 2005. Anh was one of the first interpreters to be certified by CCHI. Now, she continues to raise the standard and encourage Liaison interpreters to improve and obtain their certification in this profession. Liaison Linguistics started out under the name of Anh Okada’s Interpretation and Translation. 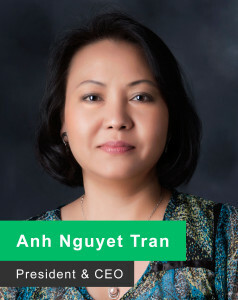 The agency was founded by Anh Nguyet Tran in 2001. At the time, there were a lot of requests for interpretation and translation primarily in Vietnamese. As Liaison’s high quality of service became known to the public, the amount of clients and the demand of service for other languages began to increase. By the end of 2013, Liaison Linguistics obtained contracts with many major medical and educational institutions. We now offer interpretation and translation services in over 120 languages along with a qualified team of over 250 interpreters and translators.